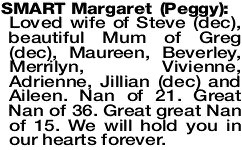 Loved wife of Steve (dec), beautiful Mum of Greg (dec), Maureen, Beverley, Merrilyn, Vivienne, Adrienne, Jillian (dec) and Aileen. Nan of 21. Great Nan of 36. Great great Nan of 15. We will hold you in our hearts forever. 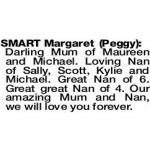 The Funeral Cortege for Mrs Margaret Jean (Peggy) Smart of Rockingham, formerly of Katanning will arrive at the Main Entrance of FREMANTLE Cemetery, Carrington St, Palmyra at 10.30am on FRIDAY (29.03.2019) for a Cremation Service. 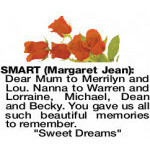 Dear Mum to Merrilyn and Lou. 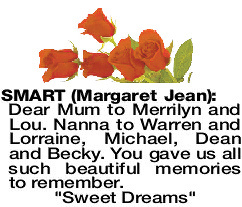 Nanna to Warren and Lorraine, Michael, Dean and Becky. You gave us all such beautiful memories to remember. Darling Mum of Maureen and Michael. Loving Nan of Sally, Scott, Kylie and Michael. Great Nan of 6. Great great Nan of 4. Our amazing Mum and Nan, we will love you forever.